After the Trump administration promised Florida that the state would be exempt from expanded offshore oil drilling, other coastal states had just one question: "What about us?" From Oregon to South Carolina, governors and other leaders are publicly noting that Florida does not have a monopoly on picturesque coasts, tourist economies or local opposition to offshore drilling. But currently, it's the only state to have received a pledge from the administration that it won't be considered for new oil and gas platforms. "New York doesn't want drilling off our coast either," tweeted New York Gov. Andrew Cuomo. "Where do we sign up for a waiver?" After the news broke about Republican-governed Florida, Rep. Adam Schiff, D-Calif., asked whether there are different rules for blue states like California. Meanwhile, South Carolina Gov. Henry McMaster, a Republican, told reporters in South Carolina he plans to ask the Trump administration for an exemption, calling it "a matter of serious importance." "The plan would determine the size, timing and location of leasing activities and would replace President Barack Obama's 2017-2022 program. It includes all but one of 26 "planning areas" in federal waters off U.S. coastlines, making up about 90 percent of the outer continental shelf. "Meanwhile, environmental organizations are alarmed and stress that it could place wildlife and coastal communities at risk of a spill." "President Trump has directed me to rebuild our offshore oil and gas program in a manner that supports our national energy policy and also takes into consideration the local and state voice. I support the governor's position that Florida is unique and its coasts are heavily reliant on tourism as an economic driver. As a result of discussion with Governor [Scott] and his leadership, I am removing Florida from consideration for any new oil and gas platforms." As NPR's Richard Gonzales reported, "Zinke did not say whether he would meet with governors of other coastal states to hear their concerns or whether Interior officials had consulted with Scott before the announcement last week." Seeking a similar exemption for California, the state's attorney general, Xavier Becerra, used some of Zinke's own words to tweet, "California is also 'unique' & our 'coasts are heavily reliant on tourism as an economic driver.' Our 'local and state voice' is firmly opposed to any and all offshore drilling." Becerra added, "we, too, should be removed from your list. Immediately." California experienced one of the worst oil spills in U.S. history in 1969, from an offshore drilling site near Santa Barbara, as member station KPCC notes. "No federal leases have been granted off the California coast since 1984," KPCC writes, and new state leases have been banned for decades. Drilling has continued on older, pre-existing leases. 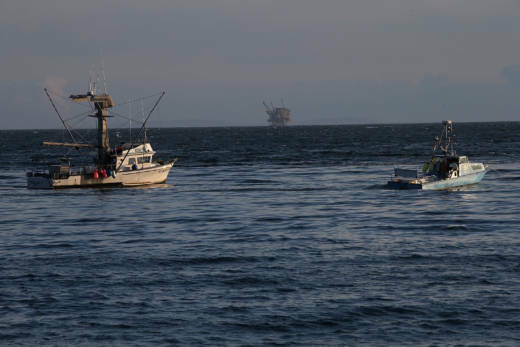 "Today, 69 percent of Californians oppose offshore drilling," KPCC reports. On the West Coast, the governors of Oregon and Washington signaled that they'd like to be "off the table," too. Virginia Sen. Tim Kaine says Virginia's governor and governor-elect have both asked for an exemption, unsuccessfully. Meanwhile, as Governing notes, it's a little surprising that the Trump administration opted to make an exception for Florida — not just because of the backlash from other states but because of the potential profit in the eastern Gulf, right off Florida's coast. "The eastern Gulf of Mexico was believed to be the most tempting new prospect for oil companies in the expansive Trump administration draft, because it is close to existing pipelines and processing facilities — not to mention the refineries in Texas and Louisiana. ... And the same geological trends that have yielded major oil discoveries in other parts of the Gulf could be replicated in its easternmost reaches." You can read more about the federal policy on offshore drilling in Merrit's story from last week.